Can You Be Too Old To Get Braces? Adjusting your teeth as an adult can correct lifelong problems you’ve had due to crooked or improperly aligned teeth. Braces treat several orthodontic problems, like an uneven and improper bite. Because of the power of adult orthodontics, other problems can be solved like headaches. Finally, of course, braces straighten your teeth and make your smile look beautiful! Some patients associate braces with adolescence, recalling pictures of the bracey kids in middle school who could barely speak over the set of train tracks on their teeth. Fortunately, this stigma is uncommon and untrue, and further still, the problems associated with braces are no longer so pervasive. There are many options for diminishing the bothersome consequences of braces. In fact, with Invisalign braces, no one will notice you’re straightening your teeth at all. Is It Safe? Invisalign braces are made of a clear, flexible plastic that is set over your teeth. They are 100% safe, as demonstrated by the more than 5 million people who have benefitted from them. Invisalign braces are BPA, BPS and latex free, and FDA approved. Is It Convenient? Invisalign braces are almost entirely invisible. Often, people wearing Invisalign braces forget they’re there at all. Additionally, Invisalign braces are the quickest and most efficient teeth-straightening method. 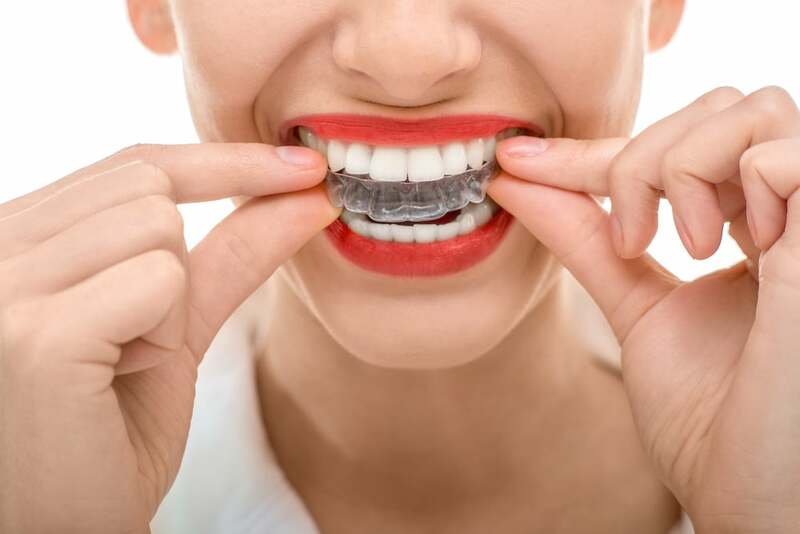 Instead of applying metal brackets to your teeth one at a time, your dentist casts a mold of your teeth, then sets the Invisalign over all your teeth at once. In fact, Invisalign is completely removable. While traditional braces don’t allow you to eat caramel, apples, popcorn, and other fun enjoyable foods, you can eat them with Invisalign. Simply remove your Invisalign braces before a meal, then brush/floss your teeth after eating and replace your invisible braces. Is It Fast? Invisalign braces are faster than traditional braces. Traditional braces can take from 1-3 years to complete your treatment. Invisalign braces in contrast can take only 9-15 months. What Are You Waiting For? Schedule A Consultation Today! If you are reading this then it’s likely you are considering an adult orthodontics solution for your smile. With discrete and convenient options like Invisalign now available, don’t wait. You can finally gain positive results in less time than in the past. Schedule an appointment with Dental Partners of Boston today to meet with an Orthodontist to improve your smile now!